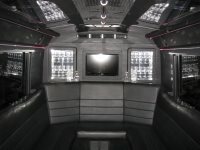 Need a limousine to accommodate a larger group? Our Chevy Limo Bus is ideal for 16 to 18 passenger groups. Whether corporate events or recreational transfers, it’s elegant features make this the ideal wedding, prom or party limousine. Look closely at the pictures below. See how the “little extras” are safely enclosed until you need them. 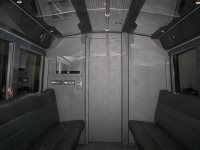 Just click on the neon lights when ready and open the doors to the large flat screen television, bar areas and pull up the table between the seats. When it comes to super stretch limousine rentals, this Pittsburgh Chevy Limo Bus is hard to beat.